It was a lovely, cloudless day on Sunday so we decided to go for a drive and visit Monmouth. The route we chose was very picturesque; from Hay on Wye, though Herefordshire and the very aptly named Golden Valley and into deep Monmouthshire, winding lanes, rolling hills and valleys with rusty coloured oaks. Starting at Hay on Wye, we drove down the Golden Valley, looking at its best in autumn colours. It’s a road we know quite well but had not been on for a while and so when we looked at each other and said, “we don’t remember this” it was obvious that we had taken a wrong turn. But what a lovely wrong turn it was, we climbed up through the small villages of Newton St. Margarets and Michaelchurch Escley, winding past ancient churches and beautiful red-stone houses. We regained the ‘main’ road at Ewyas Harold. 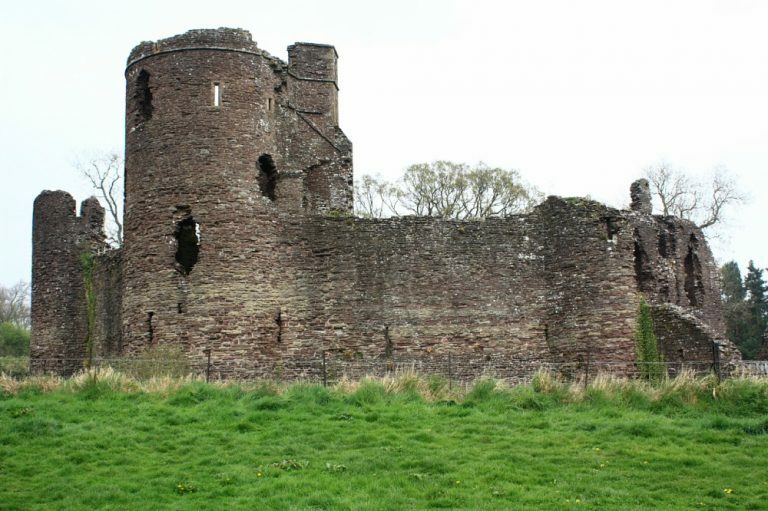 We crossed the busy A465 at Pontrilas and carried on towards Grosmont where we spied the first of The Three Castlesas Grosmont, Skenfrith and The White Castle, at Llantilio, were known. ‘Proper’ castles and all well worth a visit in their own right. The White Castle is quite stunning, although sadly, we did not have time to visit, they were built as a defensive ring against the Welsh by Normans Hubert De Burgh and William de Braose. The countryside is lovely, rolling hills and deep, oak-covered valleys with wandering brooks; the roads clear and peaceful on a Sunday afternoon. Suddenly we spotted a great big sign…APPLE COUNTY CIDER! The delicious cider that we have in the café. A detour was needed! Monmouth is a bustling county town with two great sons to its name. Henry V was born here in 1387 but less known is that Charles Rolls, of Rolls-Royce fame, whose family came from near Monmouth. An aviation pioneer, he was the first person to fly across and back over the channel in 1910. His history is fascinating and a visit to the Monmouth Museum is a must! Charles Rolls died tragically young at 32 in a flying accident. It was a lovely drive, although if you are going in a motorhome stick to the road, B4347, that we missed! We shall definitely be going back to explore the White Castle and spend more time in Monmouth Museum.